Being a professional painter in Victorian England was a difficult path for a woman, but for Elizabeth Thompson (1846-1933), left, success came swiftly, and with unexpected subjects. Born in Switzerland to wealthy English parents who believed in travel as a form of education, Elizabeth began her art training in Italy and London as a teenager, concentrating on religious subjects. While studying in Paris, she first saw the work of French painters chronicling heroic battle scenes. Inspired, her first military history painting, Missing, earned her admission to the Royal Academy in 1873. But it was Calling the Roll after an Engagement, Crimea, or The Roll Call, right, (click on the images to enlarge) painted in 1874 when she was only 28, that made her a celebrity. 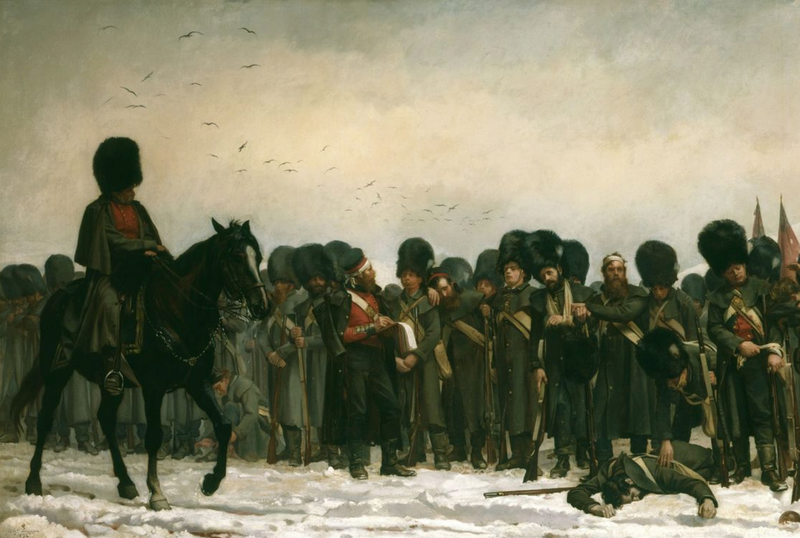 Showing the haggard survivors of a battalion of Grenadiers answering the roll call after a battle, the painting was an enormous success, drawing such great crowds that a special policeman was hired to keep order. In an unprecedented move, the painting was even removed from the Academy wall and carried to Buckingham Palace so Queen Victoria could view it privately. Her Majesty was as impressed as everyone else, and bought the picture for the royal collection. Miss Thompson next turned to Waterloo for inspiration, completing The 28th Regiment at Quatre Bras, below left, in 1875, another popular success. Her large, detailed canvases were the equivalent of big-screen extravaganzas that fed the imagination and patriotism of the British Empire, then at its pinnacle. But she also focused on the suffering of the ordinary soldier, emphasising the cost of war as well as its glory. Her battle pictures are also unusual because they most often depict the scene from the (doubtless intimidated) enemy's point of view, who are seldom shown. She was fastidious in her research, having replica uniforms made for her models. More military-themed paintings followed, and she became one of the most acclaimed artists of her time. "I never approached a picture with more iniquitous prejudice against it than I did Miss Thompson's; partly because I have always said that no woman could paint; and, secondly, because I thought that what the public made such a fuss about must be good for nothing. But it is...the first fine Pre-Raphaelite picture of battle we have had; profoundly interesting, and showing all manner of illustrative and realistic faculty. Of course, all that need be said of it...must have been said twenty times over in the journals; and it remains only for me to make my tardy genuflexion, on the trampled corn, before this Pallas of Pall Mall." In 1877 she married Sir William Francis Butler, and her career fell behind not only that of her husband, an officer in the British Army, but her new role as a mother. She joined her husband on his posts around the world – Egypt, Zanzibar, South Africa, as well as his home in Ireland – and bore and raised their six children. 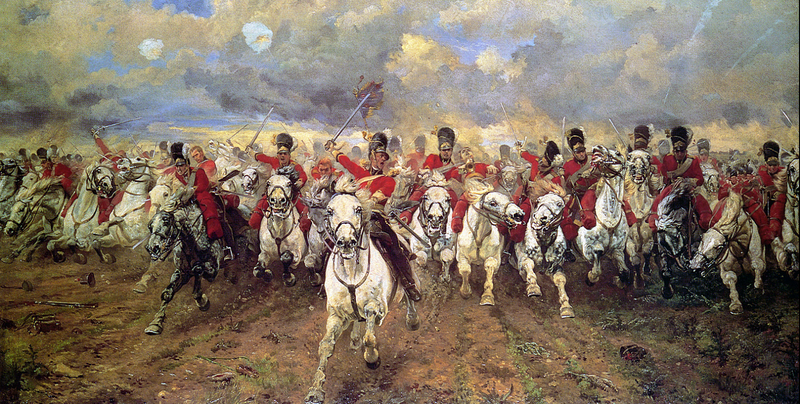 While her artistic production diminished, she still continued to paint military scenes, including the heroic Scotland Forever!, above, in 1881, which is regarded as her finest painting. She also painted and drew scenes from her travels. But the most lasting blow to Lady Butler's career is one that many artists face. By the beginning of the twentieth century, tastes in painting had changed, and her meticulously detailed history paintings were seen as hopelessly old-fashioned in the face of new, more abstract movements like Cubism. Even more damning was the shifting perception of armies and battles after the modern horrors of World War One. The grand heroic warfare with patriotic gestures and splendid uniforms of the past no longer had a place in the public imagination, and in 1924, the last painting she submitted to the Royal Academy was rejected. She died in 1933. 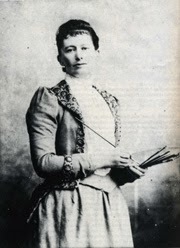 In addition to her paintings, Lady Butler also wrote three books, including her autobiography. It's available to read or download for free here; her illustrations, like the one lower right, are included and are wonderful, full of excitement that matches the life she lived. Top: Scotland Forever!, 1881, Leeds Art Gallery. Upper left: Calling the Roll after an Engagement, Crimea, (or The Roll Call), 1874, The Royal Collection Trust. Upper right: The 28th Regiment at Quatre Bras, 1875, National Gallery of Victoria. Lower right: "Got it, Bravo!" 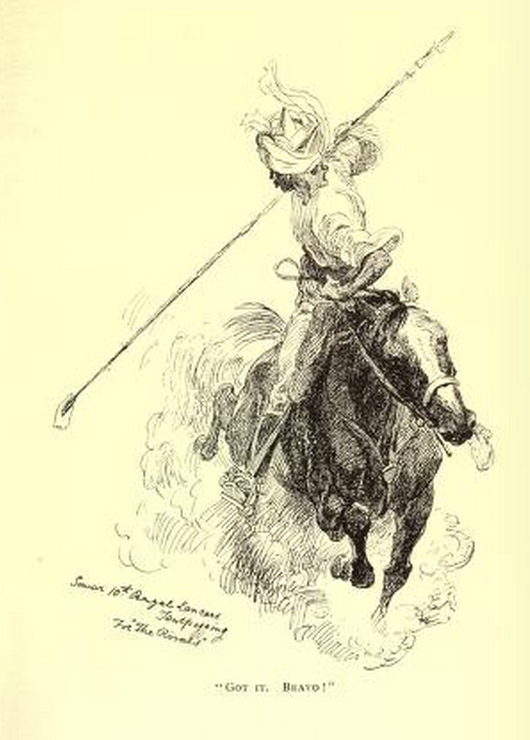 illustration from An Autobiography, 1922. You note the shifting perception of armies and battles after the modern horrors of World War One. With which I whole heartedly agree. But I worry that grand heroic warfare with patriotic gestures and splendid uniforms were already misleading during the later 19th century. Did British mothers know that their sons were dying in distant battle fields, covered in mud, wounds and cold? And not just in Crimea. 'Calling the Roll' is stunning. What a palette! For what my opinion is worth, and it is a totally honest one, this lady to me is an unsung hero of art. Fashions do change but come back again and so do works as this. War also changes and never seems to go away. The main reason for any artist going out of vogue is not just the swing of fashion by hand manipulated art but the technical advance of recording the image. When Elizabeth Thompson died (Lady Butler) in 1933 photography was already well established and people were crying out "art is dead". Art is still very much alive and this ladies always will be. From my first impressions she has caught the sad side of us only too well - what photo could capture so much feeling? Her skill in drawing the horses and men in action and the agony they were put through by their peers is phenomenal. Great site, Nerdy History Girls, thank you. I Love her work, always have.